"Scientific history" redirects here. For the study of the development of science, see History of science. 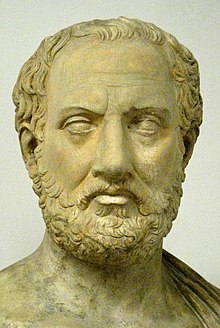 Thucydides (c. 460-c. 400 BC) dubbed the "father of scientific history"
Historical method is the collection of techniques and guidelines that historians use to research and write histories of the past. Primary sources and other evidence including those from archaeology are used. In the philosophy of history, the question of the nature, and the possibility, of a sound historical method is raised within the sub-field of epistemology. The study of historical method and of different ways of writing history is known as historiography. When two sources disagree on a particular point, the historian will prefer the source with most "authority"—that is the source created by the expert or by the eyewitness. Eyewitnesses are, in general, to be preferred especially in circumstances where the ordinary observer could have accurately reported what transpired and, more specifically, when they deal with facts known by most contemporaries. If two independently created sources agree on a matter, the reliability of each is measurably enhanced. When two sources disagree and there is no other means of evaluation, then historians take the source which seems to accord best with common sense. Subsequent descriptions of historical method, outlined below, have attempted to overcome the credulity built into the first step formulated by the nineteenth century historiographers by stating principles not merely by which different reports can be harmonized but instead by which a statement found in a source may be considered to be unreliable or reliable as it stands on its own. If it can be demonstrated that the witness or source has no direct interest in creating bias then the credibility of the message is increased. Louis Gottschalk adds an additional consideration: "Even when the fact in question may not be well-known, certain kinds of statements are both incidental and probable to such a degree that error or falsehood seems unlikely. If an ancient inscription on a road tells us that a certain proconsul built that road while Augustus was princeps, it may be doubted without further corroboration that that proconsul really built the road, but would be harder to doubt that the road was built during the principate of Augustus. If an advertisement informs readers that 'A and B Coffee may be bought at any reliable grocer's at the unusual price of fifty cents a pound,' all the inferences of the advertisement may well be doubted without corroboration except that there is a brand of coffee on the market called 'A and B Coffee.'" Garraghan says that most information comes from "indirect witnesses," people who were not present on the scene but heard of the events from someone else. Gottschalk says that a historian may sometimes use hearsay evidence when no primary texts are available. He writes, "In cases where he uses secondary witnesses...he asks: (1) On whose primary testimony does the secondary witness base his statements? (2) Did the secondary witness accurately report the primary testimony as a whole? (3) If not, in what details did he accurately report the primary testimony? Satisfactory answers to the second and third questions may provide the historian with the whole or the gist of the primary testimony upon which the secondary witness may be his only means of knowledge. In such cases the secondary source is the historian's 'original' source, in the sense of being the 'origin' of his knowledge. Insofar as this 'original' source is an accurate report of primary testimony, he tests its credibility as he would that of the primary testimony itself." Gottschalk adds, "Thus hearsay evidence would not be discarded by the historian, as it would be by a law court merely because it is hearsay." Critical-minded persons who would surely have challenged the tradition – had they considered it false – must have made no such challenge. Historians do allow for the use of anonymous texts to establish historical facts. Therefore, (relative to these premises) it is probable (to the degree p1 × p2) that this is a B. Therefore, these letters on this tombstone stand for '’Votum Solvit Libens Merito’’. McCullagh says that an argument from analogy, if sound, is either a "covert statistical syllogism" or better expressed as an argument to the best explanation. It is a statistical syllogism when it is "established by a sufficient number and variety of instances of the generalization"; otherwise, the argument may be invalid because properties 1 through n are unrelated to property n + 1, unless property n + 1 is the best explanation of properties 1 through n. Analogy, therefore, is uncontroversial only when used to suggest hypotheses, not as a conclusive argument. ^ Howell, Martha & Prevenier, Walter(2001). From Reliable Sources: An Introduction to Historical Methods. Ithaca: Cornell University Press. ISBN 0-8014-8560-6. ^ Thurén, Torsten. (1997). Källkritik. Stockholm: Almqvist & Wiksell. ^ See J. Vansina, De la tradition orale. Essai de méthode historique, in translation as Oral Tradition as History, as well as A. B. Lord's study of Slavic bards in The Singer of Tales. Note also the Icelandic sagas, such as that by Snorri Sturlason in the 13th century, and K. E. Bailey, "Informed Controlled Oral Tradition and the Synoptic Gospels", Asia Journal of Theology , 34–54. Compare Walter J. Ong, Orality and Literacy.